AIST has built a testbed of a dynamic optical path network and started actual operation. The testbed employs existing unused optical fiber facilities in Tokyo. It is a circuit-switching optical network that establishes an optical path between any users based on a request. To accommodate a large number of users, many high-performance optical switches are needed. AIST has resolved many issues of the optical switches, and this has enabled AIST to realize actual operation of the testbed for the first time. Thought experiments in combination with analogue models have elucidated the cause of the east-west contraction and crustal deformation of the Japanese islands in the Quaternary Period. 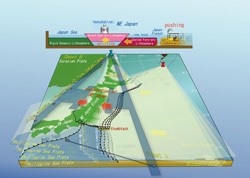 It was concluded that the cause of the east-west contraction is not movement of the Pacific Plate itself, as conventionally thought, but rather movement of the Philippine Sea Plate. AIST has developed a defect detection technology that can easily detect atomic level defects in a large field of view of a transmission electron microscope image of crystal structures, by applying an image processing technique called the sampling Moiré method. The Moiré fringe pattern can be digitally generated from the atomic array image by treating the atomic arrangement as a grid. Dislocations can be easily detected from the Moiré fringe pattern because dislocations result in discontinuity in the Moiré fringes.